James Daly was born today, October 23, in 1918. He was an theater, film, and television actor, who is perhaps best known for his role as Dr. Paul Lochner in the hospital drama series Medical Center, in which he played Chad Everett's superior. He was also the father of actors Tyne Daly and Tim Daly. According to his son Tim, during an interview Daly came out as gay a decade after divorcing his wife Hope. His struggle to come to terms with his sexual orientation nearly put a rift between him and his family. As homosexuality was still considered a mental illness until the early-1970s, he and his wife tried and failed at "curing" him. After their divorce, Daly decided to limit his contact with his children out of fear that they would end up mentally ill themselves. Daly was born in Wisconsin Rapids, Wisconsin. 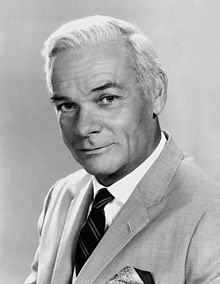 During the 1930s, Daly studied drama and acted in shows before he worked for the armed services, and served with the United States Navy as World War II ended. Between 1953 and 1955 Daly appeared in the TV series Foreign Intrigue. He also guest starred on many television series, among them Mission: Impossible, The Twilight Zone, Gunsmoke, Combat, The Fugitive, The Virginian, Twelve O'Clock High and Star Trek. Daly was also an accomplished stage actor, starting out in 1946 as Gary Merrill's understudy in Born Yesterday. Among his starring Broadway roles were in Archibald MacLeish's Pulitzer Prize-winning J.B. and Tennessee Williams' Period of Adjustment. Daly's last screen role was as "Mr. Boyce" in the mini-series Roots: The Next Generations. Daly died on July 3, 1978, of heart failure 2 years after Medical Center ended.